For years, YouTube has been plagued with videos that spread hoaxes, hateful speech, and all manner of misinformation. Its latest move to combat that is to display links to Wikipedia articles when you watch conspiracy theory videos, said YouTube CEO Susan Wojcicki at SXSW this week. Wired noted that the new Information Cues feature would surface links to Wikipedia pages on videos about things like chemtrails and whether humans have ever landed on the moon. 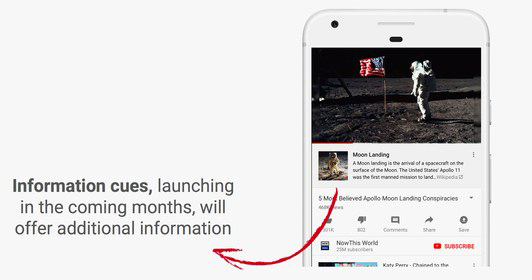 YouTube will first supplement videos that focus on common conspiracy theories floating around the web this way. That raises the question, is this the best that YouTube can do? While Wikipedia is an incredible resource for information on the web, its content is contributed by the general populace, and can be manipulated to spread misinformation. Meanwhile, YouTube still isn’t fully taking on the responsibility of censoring problematic videos on its platform, and its efforts to do continue to be inconsistent at best. The bad bit is that there’s a good chance that YouTube is sending millions of abusive conspiracy minded crazies in Wikipedia’s direction and just *hoping* that it’s resilient enough to withstand it. This is not a given! Ultimately, the Information Cues feature may turn out to be helpful – but it seems like a tiny part of a solution to a huge problem, and hardly sounds like YouTube stepping up to the challenge of fighting misinformation. The problem affects users and creators across the globe, and the company needs to do more to fix things.